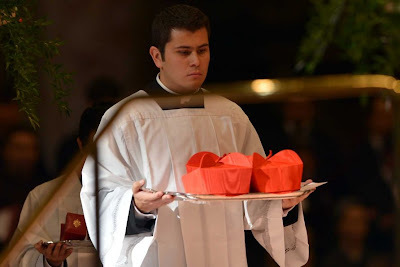 Already, in the red hats he doled out in March 2006 and November 2007, the pontiff has named thirty -- that is, at least a quarter of his successor’s eventual electorate -- so restoring the “papal senate” to its voting maximum would give Papa Ratzinger 42% of “his” cardinals in the electoral college, the remainder named by John Paul II. But here’s where it really gets interesting. Between now and the end of 2012, at least an additional 23 seats will open up just on account of electors “aging out.” The result: within seven years of his own election, B16 will have an unfettered hand to choose not just a majority of the voting College, but a contingent just shy of the two-thirds necessary to elect the Roman pontiff. What’s more, while John Paul II -- who repeatedly broke with Paul VI’s 120 limit, once ballooning it as high as 135 -- tended to name his cardinals significantly older, especially toward the end of his reign, as of today Benedict’s additions to the scarlet tide have an average age of just over 68 -- a figure bound to fall considerably once the new class takes its seats. So, that was then... and two years later, the master-count now stands at 53 electors chosen by John Paul, to 67 by Benedict. In an electoral college numbering the statutory maximum of 120, a supermajority of 80 – two-thirds, without the former plus-one – is required to elect a Pope. Should no new red hats be made by then and the dreaded, rightly fearful need arise, the requisite margin to pick Peter's successor would be 70 or less. 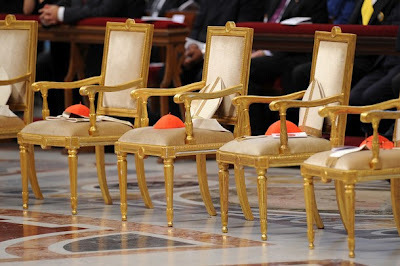 That said, it bears recalling how, at February's intake – clearly seeing the number of impending vacancies ahead – a Papa Ratzinger who had previously been a rigid follower of Paul VI's 1975 Conclave-cap expanded the potential electorate to 125 cardinals, a full eleven of whose spots would come open before the most recent Consistory was held, before quickly being replenished in this go-round. In other words, as Popes get older, they tend to get bolder... and over the next 18 months, even more than usual, anything is possible.